Seattle cultural instigator, orchestrater, and now author Michael Hebb follows his big Town Hall Seattle launch with Chase Jarvis for his new book, Let’s Talk About Death (Over Dinner): An Invitation and Guide to Life’s Most Important Conversation (Da Capo), with a more intimate setting here at Elliott Bay. This evening will include some real talk, as Michael Hebb will be joined by esteemed writer Lesley Hazleton, most recently author of Agnostic: A Spirited Manifesto. Engaging, stimulating, and surprising this should all be, as those qualities are what much of Michael Hebb’s work with food, talk, and community have been about over the years. This book’s particular focus is on death, meaning it is also about life. 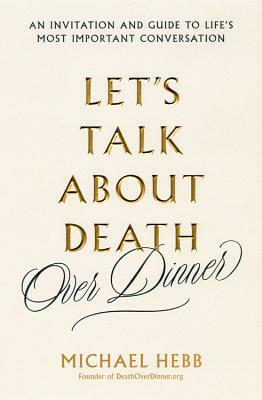 “Death, is a topic we so often avoid—yet it’s one we need to discuss. With wisdom and grace, Michael Hebb shows us how to have the essential conversations we dread, fear—or just don’t know how to have. These conversations, like this book, are expansive, filled with hope, and make us more courageous, connected and honest.” —Esther Perel. “We are such a fast-food culture, I love the idea of making the dinner last for hours. These are the conversations that will help us to evolve.” —Arianna Huffington.